One has not lived until one has built a pole barn. I felt the need to build the summer of 1996 so I built a 12 stall pole barn. I chose roomy 12x12 stalls with a 12 foot wide aisle. There will eventually be dutch doors directly to the outside from each stall. 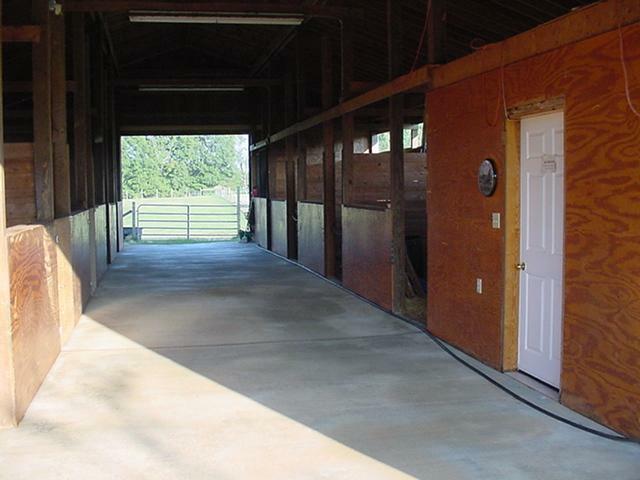 Concrete for the aisle, wash stall, and tack room was poured. I found a relatively level place on the property set back enough to satisfy the zoning. The eye says "scrape a foot with a box blade on the tractor and you will be ready to go." The eye lied. My neighbor shows up with a Stanley electronic fluid level. I ended up scraping three feet of soil. Good thing about it was that there was a foot of topsoil. 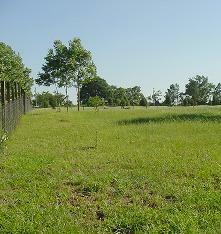 At least the grass should grow O.K.. I dug holes with a tractor mounted hole digger. Not that hard but time consuming. Start placing and bracing 16 foot pressure treated poles in holes after redigging misplaced holes. Redigging holes in the heat of a Georgia summer and then hoeing concrete mix is a warm treat. Now dig holes and place 20 foot poles. 20 foot poles are a bit heavier than 16 foot poles. One person can wrestle them, but two people would have been better. I think I hoed about 4 tons of concrete, one bag at a time. Many weekends later the 16 foot poles are done. I am a bit too macho at times for my own good. I did not cause any anatomic damage. The poles were correctly placed on three corners and only out an inch on the other. Get out the transit to mark witness marks. Two people would have been nice, but you make do. Witness marks are used to trim poles to length. Nail up girts to the poles after plumbing them. They may have been installed plumb, but the hot summer makes those pressure treated poles twist as they dry. We do not like the noise of a metal roof so we chose a shingle roof. Cut and install 2x8 rafter. 2x6's were on the edge of the span chart. May have passed inspection but not worth the risk. Dave helps install and nail rafters using rafter collars. I chose collars to save the time of cutting multiple birds mouth cuts. I also have more faith in the nailing method using collars. Install decking. Gary wondering whether a beer and a ball game would have been a better way to spend a Saturday. Nail gun is your friend as you install 100 sheets of decking. I used OSB which was about $10 a sheet cheaper than 5/8" plywood. We don't have a snow load to really worry about so the 1/2" is adequate for the shingle and wind load. Install 15# roofing felt and drip edge in a day with two helpers working a half day. Install 34 square of shingles. I thought that would never end. It took me a week to install the shingles. After the third day, my speed was up to the point of making wage. Almost close to my daily salary. Nail gun is your friend again. The shingles also stuck together on the warmer than 70 degree days so I could not stock the roof. I did enjoy those 40 and 50 degree days. Installing continuous ridge vent was another day's work. Install T111 5/8" plywood siding. Nail gun once again makes the job easier for one person. Wind needs to stop so the plywood won't try to fly out of your hands while nailing. Watch Father go to hospital after tearing tendon loose from bone while helping with siding. Plywood was about a week of solo work. Install 1x6 trim. Roll on primer. Try to spray on paint only to find that cheap sprayer doesn't have enough oomph to spray 100% acrylic paint. Roll on. Weld sliding door frames, install trolley, hang door frames, install siding to frames with self tapping screws. Prime and paint doors. Three days work. The view of the finished rafters. I am a bit of a tool nerd so visits to the pawn shop netted great nail guns that saved a lot of time. The nails cost a bit more than loose nails, but I find more satisfaction in quantity done. I saved three weeks with the nail guns. The scaffolding was left over from construction work at the museum I worked at. I bought another walk board and some casters to roll the thing around on. It made the toting of shingles up to the roof relatively easy. We finished the stalls on the cheap. The front and back of the stalls are framed with 2x6 and covered with 3/4" plywood. The walls between the stalls are 2x6. The stalls still need some details to make them complete but they do keep the horses in at night. We will finish the dutch doors from each stall to the outside later too. I probably spent a few months so far but haven't kept track. What could be more fun than building a barn instead of vacationing. We were waiting during most of 1996 for a mortgage company to agree to lend us money to build a house. Those of you that haven't experienced the joy of trying to acquire a construction/permanent loan have missed out on another of life's character building experiences. We finally gave up on the mortgage jokers and went to a bank that was ready to help us out. 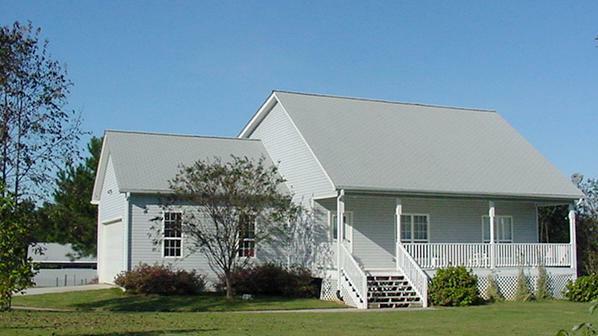 It took about eight months (February 1997- September 1997) to build the house. We did the wiring and all the interior finish work (tile, hardwood, trim, paint) by ourselves, which is a bunch of work. The interior of the barn, fall 2004. I never got pictures after it was newly completed, so you are looking at it after seven years of use. Most of the stall doors are "closed" with just a stall guard, but we do have half doors on the foaling stall to the left and a full door with bars on the stallion stall at the right side end of the aisle. The tack room door on the right foreground still needs trim, and we'd like to run a water line to the ends of the barn so we don't have to drag a hose. A work in progress! 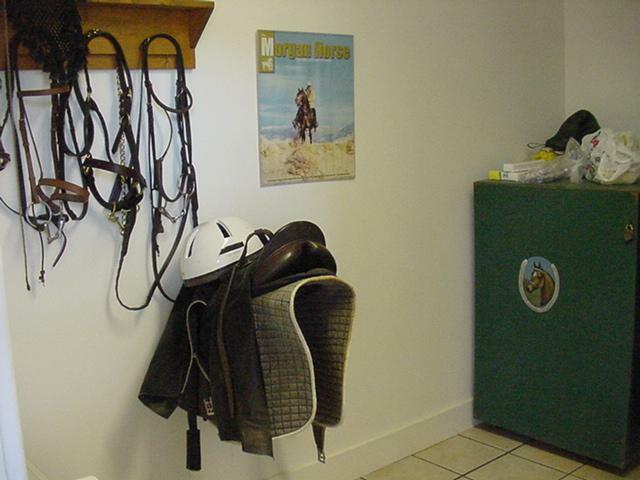 The tack room was finished in 2001. It is 12' X 12' with a tile floor and trim that matches that in the house, and includes a bathroom (located to the right of this view). Being well insulated, it stays cool in the summer and warm in the winter. The bridle rack you see here is another of Jim's creations. He also did the tackbox, and Laura painted the portrait of Marie that is on the front of it. 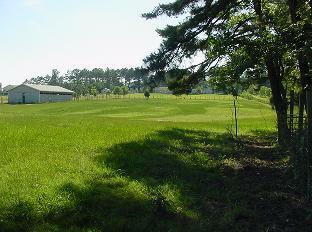 Here is the finished barn, run-in shed and the back of the house; view from the rear property line, May 2002. 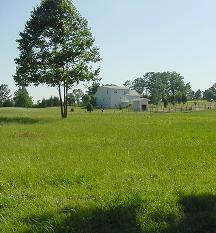 There is another pasture on the other side of the house and barn. This is the front of the house, October 1998 photo. You can see the barn behind the house to the left. Our plants and trees have certainly grown! October 2004 photo.